of these two young men from Waterloo, Ontario. 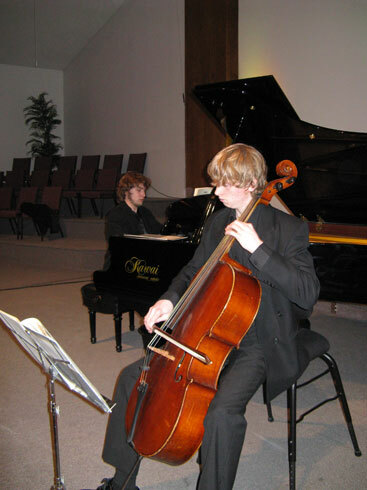 Both have won several scholarships and awards at music festivals and much much more! 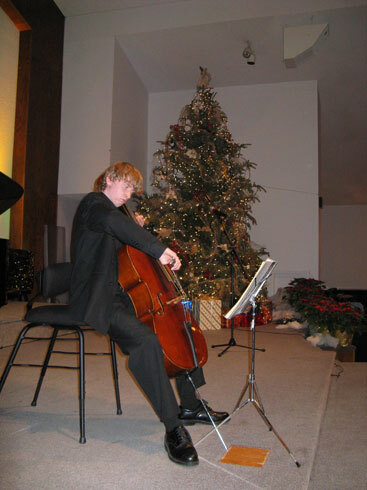 In 2007, we began working with Chadd Yaniw to customize an Allegro Performance Chair for his specific needs as a cellist. Sitting very high (close to 25″ from the floor) involved using 14″ leg extensions fully extended (look closely). Spacers provided the forward slope he liked best, and the back support has a 4″ bend in the back bar. 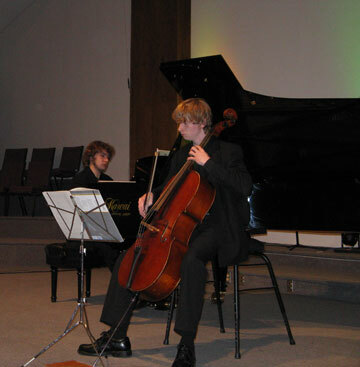 In concert January 2008 in Barrie, Ontario, with brother Todd, piano, Chadd, cello, is using the Concert Design Allegro Chair customized for his needs. This photo provides a good look at the back support with 4″ bend in back bar. Chadd had an additional 1.5″ spacer installed at back bar hinge to bring the back support forward to mid-seat. The Allegro frame is lightweight aluminum for easy transport from home rehearsal to onstage. The Allegro Chairs are manually adjusted, ahead of time, for optimum stability. No spring-locks or hand-tightening devices are used to give way and break down. All adjustments are done ahead of time, secured manually, so that there are no wobbles or holding failure in performance. The Allegro Chair lasts!